Sometimes, it’s the simple and quirky ideas that seem to make the biggest waves. 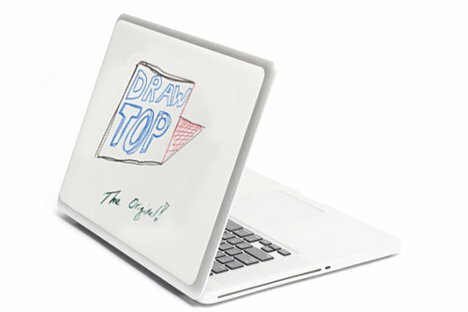 The DrawTop is a nifty idea that mashes up high-tech and low-tech to come up with a product that is really unique and wonderfully creative. Dreamed up by Ryan Mitchell as a project for a product development class, the DrawTop took on a life of its own. After Mitchell graduated and was no longer producing DrawTop, the orders kept pouring in – so she decided to turn it into a business. 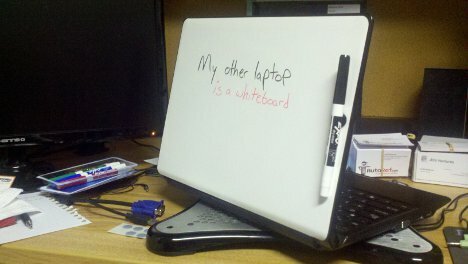 The premise is deceptively simple: a vinyl sticker adheres to the lid of your laptop to turn the surface into a reusable whiteboard. 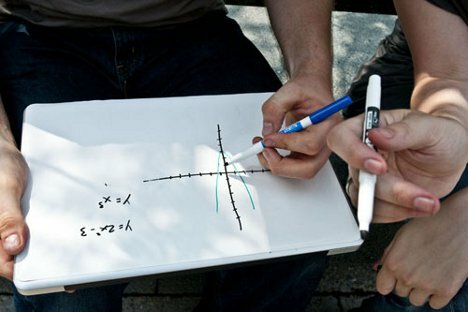 Although you may wonder why someone with a laptop would simultaneously need to use a whiteboard, that question is easily answered when you think of all the times you’ve been trying to explain something and only drawing a diagram will do the trick. The DrawTop comes with a set of markers, an eraser cloth, and a set of Velcro dots for sticking your markers to things – all for $12. According to the company, the vinyl adhesive doesn’t leave a residue and, if you should decide you can live with a plain old laptop again one day, the DrawTop should peel right off with no damage.